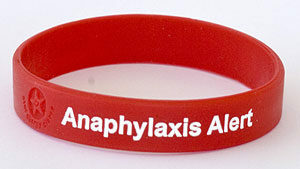 Anaphylaxis is a life threatening whole body allergic reaction. The main treatment for Anaphylaxis is Epinephrine (Adrenaline) delivered via an autoinjector device. You can learn more about Anaphylaxis by taking our free online Anaphylaxis Awareness training course. There are a variety of autoinjectors on the market. Although they all carry the same drug (adrenaline / epinephrine) they may operate in slightly different ways. Patients and their families should all be trained in how to operate autoinjectors. The recommended site for injection for all autoinjectors is the side of the thigh. The drug is injected into muscle and not into a vein. Epinephrine autoinjectors require a prescription from a healthcare professional. Training devices are available from the manufactures. These devices do not contain the needle or drug and can be used to practice the technique. Here are instructional videos on how to use the three most common types of autoinjector: EpiPen, Jext and Emerade. What does FISH SHAPED stand for in first aid?